The Grindlay company produced excellent sidecars in the early 1920s, so their foray into full motorcycle production under the Grindlay Peerless name in 1923 was perhaps understandable, given the availability of ‘loose’ engines by JAP, Rudge, Villiers, etc, and plenty of small factories offering frames, gearboxes, wheels, etc…the typically British ‘built up’ motorcycle, which includes the most famous names in all of motorcycling! G-P’s first machines were powered by JAP single and v-twin engines (both SV and OHV), and Villiers lightweight two-strokes of 172cc – 246cc; a complete range of sizes and configurations for an ambitious new company. But ‘the game’ was to exhibit a range of motorcycles at important shows like the Olympia event in London, plus a few ads and press reports, and await the orders. 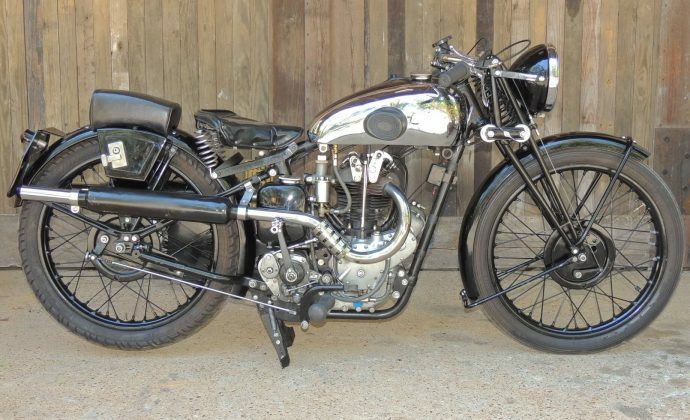 To boost sales, G-P hired a professional Brooklands racer, Bill Lacey, to prepare a special machine under the Grindlay Peerless banner, using a 500cc JAP OHV racing engine…a machine it must be noted he built entirely himself, with G-P payin the bills. In his typical fashion, Lacey’s Grindlay absolutely gleamed, being totally nickel-plated, and even better, became the first 500cc motorcycle to record 100mph for one hour at Brooklands in 1926. Grindlay Peerless lost no time capitalizing on this success, and built 6 all-nickel replicas of that machine, each tuned by Lacey’s mechanic Wal Phillips, and called the ‘100’ model. Sales naturally increased, and the relationship with Lacey continued as he increased his speed at Brooklands, and Lacey by 1929 had raised his own ‘hour’ record to over 105mph. 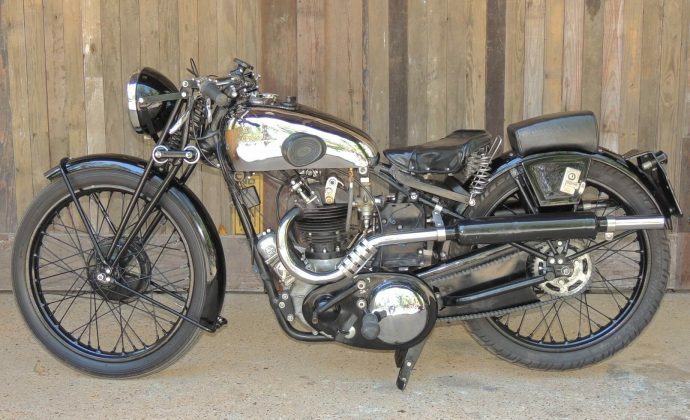 An OHV JAP v-twin version of his racer proved a terrible handler (although a spectacular looker), and Lacey abandoned the machine, and the factory, afterwards, moving on to Norton OHC racers by 1930. 1930 coincided with other difficulties at Grindlay Peerless, and while they produced fine machines with an excellent sporting reputation, the Depression was merciless, and their model range gradually reduced to include only single-cylinder JAP models by 1931. By 1932, G-P only used Rudge ‘Python’ engines, and while their bikes still had an excellent built quality with sporting pretensions, sales lagged. The final models for 1933 and 1934 included 3 Rudge-engined machines – the low-cost ‘Tiger’ model with 500cc engine, the ‘Special’ or ‘Tiger Chief’, a full racer with a ‘TT Replica’ Rudge engine, a ‘Tiger Cub’ with 250cc racing Rudge engine, and in late 1933, the ‘Speed Chief’ was added, using a Rudge Ulster engine, capable of 100mph, with upswept exhaust, a 4-speed Burman gearbox, and full electric lighting. With motorcycle sales generally in the doldrums by the mid-1930s, Gringlay Peerless stopped motorcycle production in 1934, to concentrate on other products.